Those little pumpkins are the one's I roasted to make these pies. They're perfectly sized. I have a weakness. I love walking through Costco! I especially love walking through Costco around late Sept. early Oct. and spying the enormous Pumpkin Pies in the bakery dept. And they're cheap. Even in Hawaii they are cheap. Like $5.95 for a huge pie. And my dear friends, the crust may not be spectacular, but the pie is lovely. My family can do some serious damage to a pumpkin pie in no time at all. Another confession. I will now make all of my pumpkin stuff with real pumpkins. Next summer my entire garden is going to be planted in adorable Sugar Pie Pumpkins. I'm going to have a huge pumpkin patch. I love those perfectly sized pumpkins! 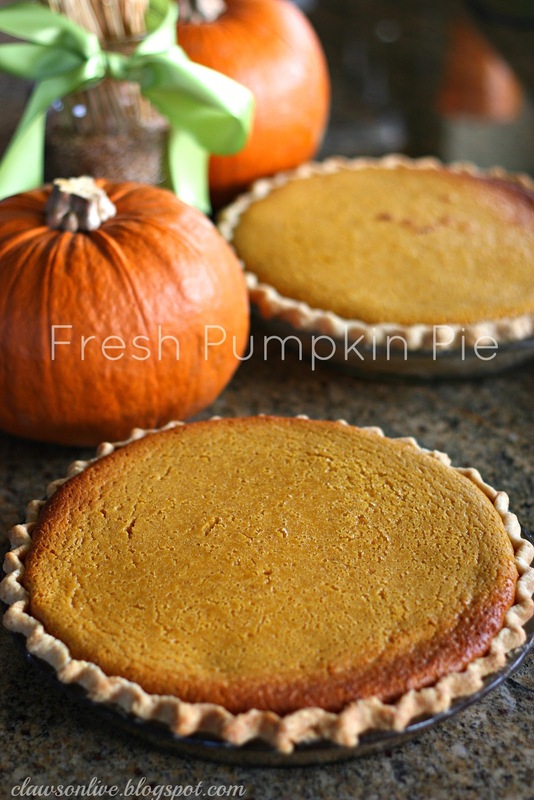 I have bought a few of them the last few weeks, and my word, they make the best Pumpkin Pies. They even beat Costco's! Add a homemade pie crust, and there is nothing better in the world. I've made 4 of these in 2 days. My family has only eaten 2, and the other two were given away. One to my perfect neighbor who has taken my garbage out for me the last 2 weeks. And I'll bet he's done it many more times without me noticing. He's really nice. I hope you all have a neighbor like George. I will totally share a pie with perfect neighbors. Each one of the lovely little Sugar Pie pumpkins pictured above makes 2- 9inch pumpkin pies. 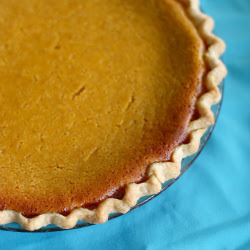 I follow the Libby Pumpkin Pie recipe, but substitute 1 cooked Sugar Pie pumpkin for a 29 oz. can of pumpkin. It works perfectly every time. So enjoy your pumpkin pie my friends. I keep telling myself I'm just practicing making these pies so they'll be perfect by Thanksgiving Day. Who am I kidding? Let them eat pie! Every day! MIX sugar, cinnamon, salt, and ginger in small bowl. Beat eggs in large bowl. Stir in pumpkin and sugar-spice mixture. Gradually stir in evaporated milk. BAKE in preheated 375' F oven for 75 minutes or until knife inserted near center comes out clean. Cool on wire rack for 2 hours. Serve immediately or refrigerate. Top with whipped cream before serving. Here's my favorite pie crust! Combine flour, cornstarch, salt and sugar. Cut in shortening. I actually like to use Manteca Lard a lot of the times. My sisters friend Makita gave us this tip a few years ago and it make delicious pie crust! Mix egg, cold water, and vinegar. Blend into flour mixture until it forms a ball. Try to handle the dough as little as possible. Makes 4 single pie crusts. I always make the whole recipe. If I have dough left over I just plop the dough ball into a Ziploc and put it into the freezer. All you have to do is thaw and roll when needed. Anxious to try a pie from a real pumpkin. Very nice post. I simply stumbled upon your weblog and wished to mention that I've really enjoyed browsing your blog posts. In any case I will be subscribing for your rss feed and I am hoping you write again very soon!